The outdoor is a very lively place, but often, it is also a harsh and unforgiving territory as well. When you find yourself in an expedition into the wild, it will hold zero tolerance for the weak. Either men or equipment needs to be tenacious so as to withstand the full brunt of Mother Nature. In the wild, it’s also important to keep your food inventory cold and fresh at all times. This is why you will need a strong and capable cooler right next to you in your trip. And what is a better way to ensure the integrity of your cooler when tested against the worst of the Wild: Bears? In this article, we’ll learn about the best bear proof coolers there are on the market. Bear-proof Coolers are, as their name may suggest: A ridiculously durable and well-built cooler that can survive a frontal assault of a grizzly bear. They are often made from strengthened plastic so that it can be lightweight with high endurance. These coolers are also designed with the shock-absorbing body and large hinges to increase their chance against the wild. Certainly, they will also fill the part of a standard cooler with optimized ice retention to keep your perishables safe. When bears and animals broke into a cooler and digested what’s inside, the items within can harm them. The situation can escalate as far as killing the animal. And worse yet, it can create great dangers for other campers as the animal can go into a raging fit. This is the reason why the Interagency Grizzly Bear Committee (IGBC)’s certifications are given out. By passing the rigorous tests administered by the IGBC, a cooler can keep your food, drinks and different items safe from bears and animals. And if the cooler is breached, the cooler can keep its contents from endangering the animal. And thus, bear-proof coolers are naturally resilience and sturdy, making it perfect for a long and harsh expedition. There is an overwhelming number of bear-proof coolers out there that comes in different shapes and sizes. That’s why it’s easy to be indecisive about the final piece that will accompany you and your crew on the trip. In this section, we’ll show you the best bear proof cooler that can be a great addition to your endeavor. Many candidates are clearly worthy of being on our list; however, we’ve shortened it down to three. One of the things you should take note of when you invest in a bear-proof cooler is size. Size is very important and knowing your cooler’s purpose can save you a lot of money in the long run. It will also save you the trouble of having to carry around an oversized cooler with little significant items within. As you can see, the overall largest cooler is the Pelican Products ProGear Elite Cooler. 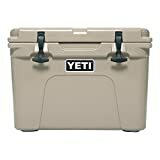 It is then followed by the Grizzly Cooler Hunting Cooler and at last place the YETI Tundra 35 Cooler. The larger a cooler, the heavier and more expensive it can be. Therefore, set out your requirements before choosing the best bear proof cooler for you. 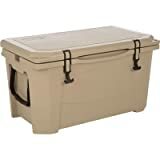 Yeti has been the primary brand in the outdoor cooler market for a long time with their splendid cooler lines. It’s not surprising that they came up with a design that can survive any hardship along the way. The Yeti Tundra utilized many patented technologies to buff and armored up every exposed inch, making it virtually indestructible. From the heavy-duty hinges and the thick pads of its lids, it doubtlessly passed the batteries of the IGBC flawlessly. It also contains a wealth of minor features that will make your outdoor adventures much easier. For example, it has a dry goods basket to keep your dried supplies in good condition throughout the trip. The cooler also featured anchor points and non-slip feet to enhance mobility and handling. You can slip ropes through these anchor points and tie it securely down your truck or boat bed. When you’re at the muddy riverside, these non-slip rubber feet will be of great help to you. Long been an attractive go-to model for many camping enthusiasts. The Yeti Tundra can offer you both great ruggedness and be preserving performance with thick, UV-resistant isolation. It can retain ice for up to a week at its best to give you the best performance and efficiency. It can also hold 20 cans of beverages or a dozen or two pounds of ice. Although quite heavy, it is small enough to be hauled by only one person. Featured many minor convenience details. Quite heavy. (17 pounds empty). Even though Pelican is a relatively new face in the market, they’ve done their job very well. The Pelican Products ProGear Elite Cooler is a very formidable competitor to Yeti’s trust monopoly on the market. Built with great attention to details and sturdiness, there’s no doubt that the Pelican can hold itself against challenges. Like most bear-proof coolers, the Pelican is designed with a strong shock-absorbing frame made out of plastic. Its vulnerabilities such as the hinges and the locks are fortified so even with deliberate sawing; it won’t come out easily. Many details are also made from stainless steel, adding the general strength of the product even further. It’s certain that the Pelican would survive the immense blunt force of a bear’s paws. And of course, this has been put to the test with IGBC’s standards. The Pelican, unfortunately, lacks the many minor details that made the Yeti Tundra so great: Such as the dry basket and anchor points. Important details such as non-slip feet are still present as standard, but there are still juicy details that are still missing. The Pelican is a great cooler for its price, being at a relatively lower cost than a Yeti. However, one of its greatest downsides is its weight that is substantially heavier than the Yeti Tundra. Therefore, it will take some effort to move it around, but with ice retention up to a week, it’s worth it. Much heavier than the Yeti. Grizzly Cooler is the professional in making bear-proof coolers, and that is expressed right through their name. It is not only an adaptable and capable cooler but also very customizable. Just like any other bear-proof coolers, the Grizzly is specifically designed to be solid. The outer shell is made of rotomolded plastic that can withstand a great amount of damage without losing shape. It is also equipped with bear claw latches that can keep the lid shut tight no matter the damage done to it. Other ‘armoured’ details such as the stainless-steel pins and molded-in hinges testified to the true ability of this cooler. Just like its Pelican predecessor, the Grizzly lacks the many special features that made the Yeti so great. Still, the Grizzly still has non-slip rubber feet to prevent slippage during transportation and rope handles for stability. Nonetheless, the Grizzly will still do its job well despite the omission. At an empty weight of approximately 10-15 pounds, the Grizzly is a very light cooler compared to its two oppositions. Also, as compared to its opponents, it comes in many colours and sizes. It comes in 16 different colors and textures that can make it blends well into the environment on a hunting trip. While for the Yeti and the Pelican, you only get 3 and six color choices respectively. There are two sizes, a 40-quart version, and a 75-quart version. The former is better for an individual or a small group, while the latter is fitting for a family trip. Either way, the Grizzly still presents its customers with a wider range of choices than the rest. More expensive than both the Yeti and Pelican. All three options are aimed at a specific audience, and it’s your job to choose the best bear proof cooler for you. If you are on a budget, it is best to go for the Pelican. If you value convenience in your cooler, you can find that in a Yeti cooler. And finally, if you like the ability to choose different styles, it’s best to choose the Grizzly. All of them have roughly the same ice retention ability at around a week time as well as ruggedness. Thus, it’s more about the budget and your preferences that constitute your final choice more than anything. And whatever your decision is, we hope that you find this guide useful for you. Have a good trip!